** We are pleased to announce that the Westin Nanea Villas next to Honua Kai is finishing, so our guests will have a new, beautifully landscaped resort to look at....with a nice partial view of the Ocean from the fifth floor!! ** We are NOT affected by the construction of the Luana Townhomes! This is a great value for guests who want to stay at a new Four Diamond (AAA rated) resort and enjoy all of Honua Kai's great amenities....with an ocean view as a bonus! You can experience everything Maui has to offer during the day, and come back to a clean, luxurious condo to rest. Honua Kai is located north of the Westin Kaanapali Villas and south of the Mahana, across the street from The Times Market. Enjoy the new, luxurious accommodations with great amenities on a beautiful beach and great snorkeling! There are three large pools at Honua Kai, each with its own character. The FORMAL Pool is an infinity-edge lap pool featuring two hot tubs and perfect ocean views. The OHANA Pool features a one hundred and twenty foot WATER SLIDE and a waterfall that cascades into the main swimming area. Natural lava rock will form an elevated hot tub that takes in the ocean views. The Ohana Pool also has a sandy beach and a shallow pool for the kids. The RIVER Pool features a meandering river that flows through smaller swimming holes and waterfalls. Honua Kai also features Duke's Beach House, an Oceanfront restaurant run by the same owners of Kimo's, Hula Grill, and Leilani's. Great food at reasonable prices for breakfast, lunch and dinner, in addition to poolside service. Experience the beautiful sunsets on Kaanapali Beach with live music nightly and a wonderful dining experience! Large fitness center with state of the art equipment is on the ground floor of the Konea Building. Ho'ola Spa in the Konea Building is now open. Located on the Fifth floor, our One bedroom, One bath condo has a partial ocean view. At 700 square feet plus the 150 square foot lanai, our condo comfortably sleeps four. **Granite countertops in kitchen AND bathroom with warm wood cabinetry. **Free Wi-Fi - bring your laptop! **King-size bed in bedroom with down comforter and pillow-top mattress. **Queen sleeper sofa in living room OR use Queen Aerobed instead. **Large bathroom with Frameless Shower Enclosure and separate tub. **Custom floor-to-ceiling folding doors leading to lanai. **Lanai has large dining table with four chairs and recliner with ottoman for alfresco dining and relaxing. **Flatscreen TVs, Blu-ray player, and iPod docking station for your enjoyment. **Provided luxuries includes: bathroom products from L'OCCITANE, picnic setup, etc. **Library of family-friendly DVDs with a stereo system for those lazy days. **Boogie boards, beach chairs, umbrella, pool toys and cooler in condo for you to use. Parking is included in our rates and there is NO RESORT FEE! Our secured, underground parking keeps your car cool from the sun, and is close to the elevators that leads you to our condo. This eliminates the need to walk through the lobby with your luggage or groceries. Why pay $400 or more per night for a ocean view hotel when you can enjoy the luxury, convenience and spaciousness of a condo? Whether you are planning a honeymoon or a vacation for a family of four, this condo will be perfect! WE ARE TAKING RESERVATIONS OF FIVE NIGHTS OR LONGER, THOUGH SHORTER STAYS ARE WELCOMED TO FILL CALENDAR. Hi, thank you for taking the time to read our webpage. My wife and I, along with our four kids, live in the suburbs of Atlanta, Georgia. I work at a hospital near us, and my wife, Kristine, takes care of the household. Kristine is Hawaiian, and when we go back to visit family, we usually stay at a hotel. We normally visit Maui twice a year, and since we have outgrown hotel rooms, it just made sense to buy a condo with great amenities so that we feel like we ARE on vacation. We take a lot of pride in keeping our Honua Kai condo perfect and our guests happy. Our condo is filled with amenities to make sure that you are comfortable, and will happily do everything we can to accomodate your needs. Honua Kai is a brand-resort on North Kaanapali Beach. 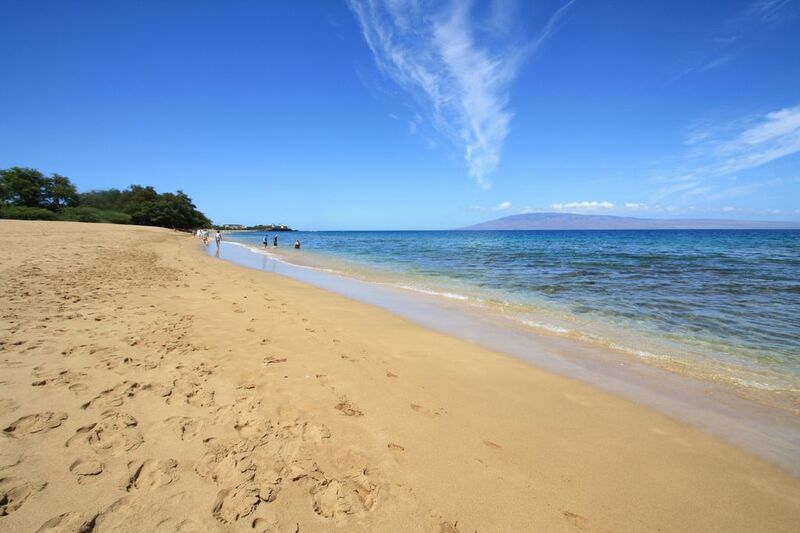 This area is quiet, has great views of Lanai and Molokai, and you can snorkel right on our beach. Relax poolside and take in the sunset, its very peaceful. From November to April, you can catch whales playing in the Ocean. With new furnishings, a fully-equipped kitchen, and hi-def TVs, there is no reason to leave the condo. There are so many amenities at Honua Kai, including Concierge Service, an Activities Desk next to the Pool, TEN Viking grills for you to use, and two fitness centers. Pacific Ocean views from the fifth floor. Unlimited local and long-distance (to US, Canada, and Puerto Rico) are included. Bosch front loading Washer in unit. Laundry detergent provided. Bosch dryer with Bounce sheets provided. Underground parking is included in our rates. Four oversized beach towels and four sets of bath towels provided. Brand new Bosch Stainless Steel kitchen, with dishwasher. Blender, coffeemaker, even martini shaker for your use. Three bar stools and dining set for four inside the condo, large lanai table with four chairs on the lanai. (2) 42 inch LG flatscreen in Living Room and 37 inch LG in Bedroom. Upgraded Hi-def programming. Maui guidebooks for our guests to use. Movie Library for those lazy days or sleepless nights. We strive to provide you with luxuries you would find in a Four Seasons or Ritz Carlton hotel. This includes bathroom amenities from L'OCCITANE, picnic setup, boogie boards, etc. Cozy, well equipped and comfortable. Louis was a great host. Thank you! We had a great time staying in this condo for our spring break trip to Maui. The condo has everything you need, including beach chairs, umbrellas, cooler, snorkel gear and body boards so you don't have to bother buying or renting. The condo is very quiet and has nice partial views of the ocean and the mountains to enjoy and the beds are comfortable, including the pull-out bed in the living room. We also enjoyed the underground parking spot. The owner is fantastic and responded quickly with any questions we had. I would strongly recommend this condo. We enjoyed a wonderful stay and appreciated all the amenities that the hosts provided such as beach towels, chairs, snorkel gear, and umbrellas. The condo itself was very clean and decorated beautifully, and we enjoyed watching sunsets from the balcony. The property has everything you might need with excellent food options, several different swimming pools, and a beautiful beach just steps away. We appreciate how welcoming and attentive our hosts were, and will absolutely be back! Really enjoyed our stay and the unit. Prompt responses to questions. Would highly recommend. Really enjoyed the stay in this condo. It is a nice place with nice view. Check in and Check out are quick and convenient. Gym is in another building. This was our fourth stay at Honua Kai. We love coming here. The property is great for families - we love the three pools, waterslide, easy beach access, Duke's restaurant on property. There were two issues with this condo: 1) the first night when we pulled out the sofa sleeper, there were food crumbs. A lot of them. The cleaner had not changed the sheets. Ugh. I realize this is the cleaner's error and not the property owner's fault, but nobody wants to sleep on someone else's dirty sheets, especially after a long flight. There were no extra sheets to be found in the unit. I would recommend stocking extra sheets and blankets for this purpose. My poor husband and daughter had to sleep on these sheets and the following morning we washed them - we were simply too tired to stay up another 3 hrs to wash and dry them (dryer takes longer than most). 2) The hot water ran out very easily. I take very quick showers (faster than my husband) but if I washed my hair while the kids were in the bath (which was the case each time) I ran out of hot water. Yikes. I definitely enjoy coming to this resort but would probably choose another unit next time. Aloha Marie, thank you for taking the time to write this review. We take a lot of pride in keeping the condo perfectly cleaned and our guests comfortable, so it is disappointing that our housekeeper did not check the sofa sleeper before your stay. I am glad that the rest of the condo was cleaned well. This is the first time that has happened in our twelve years of managing condos and we will work hard to make sure it doesn't happen again. Everything looked good when you checked in at 3pm and when we talked the next morning, you mentioned that your husband and daughter slept with you in the king bed that night. It just doesn't make sense for your husband to sleep on dirty sheets with your daughter while you slept by yourself on the King bed as mentioned in your review. Our housekeeper did bring extra sheets and towels after we talked. I wished you would have let us know right away about the sofa sleeper, as our Property Manager lives five minutes from Honua Kai and would happily take care of any issues. All condos at Honua Kai (other than the three bedrooms condos) have a 40 gallon hot water heater, which is standard in most homes. Unfortunately, it will empty when the tub is filled (and shower on at the same time), so it just needs a few minutes to heat up again. We're glad that you had a great time at Honua Kai and hope that you will give us another chance. *** FIVE NIGHT MINIMUM REQUIRED FOR RESERVATION, THOUGH SHORTER STAYS ARE WELCOMED FOR GAPS OF LESS THAN FIVE NIGHTS *** Please add GET and TAT taxes of 14.42% and $175.00 cleaning fee. To reserve, we require a 25% Reservation Deposit and the balance will be due one month before check-in. Cancellation Policy - Reservation Deposit will be returned if guest cancels at least 60 days before check in date. In room WIFI and parking is included in our rates. NO RESORT FEES!! We supply four beach towels, two beach chairs, cooler and two boogie boards for our guests to use. Condo is also stocked with a starter supply of L'Occitane soaps and shampoo, paper products and laundry detergent.